ZELIFF, William H., Jr., a Representative from New Hampshire; born in East Orange, Essex County, N.J., June 12, 1936; graduated from Milford High School, Millford, Conn. 1954; B.S., University of Connecticut, Storrs, Conn., 1959; Connecticut National Guard,1958-1964; United States Army Reserve; sales and marketing manager; consumer products division, E.I. 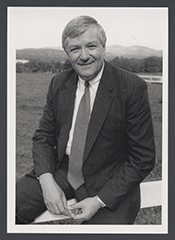 DuPont de Nemours and Co., 1959-1976; innkeeper and small business owner; unsuccessful candidate for the New Hampshire state senate in 1984; delegate, Republican National Convention, 1988; elected as a Republican to the One Hundred Second and to the two succeeding Congresses (January 3, 1991-January 3, 1997); was not a candidate for reelection to the United States House of Representatives in 1996, but was an unsuccessful candidate for gubernatorial nomination in New Hampshire; private advocate. Videocassette: 1994, 2 commercials on 1 videocassette. The commercials were used during William Zeliff's 1994 campaign for U.S. Congress in District 1 of New Hampshire, Republican Party.